Sounds European! : Let's talk about your background. Among all band members, who are the common idols you had when you were growing up? Do you feel they have influenced the music you currently make? Adrián Gutiérrez (Nunatak): Although each one of us has his own personal experiences, we all have common points. We all grew with the grunge of Nirvana or Pearl Jam, the metal of Korn or Deftones, the rock of Incubus or Red Hot Chili Peppers, and classics such as Black Sabbath or Led Zeppelin. Of course, we were marked by everything we listened in our teenage years. I remember very fondly the day my way of understanding music changed forever. As in many cases, I started thanks to my older brother, who had just bought a CD. He played it on my father's stereo on a deafening volume. I was doing my homework in the other end of the house, but hearing that thunder, I felt an unappealable force drawing me towards it. It was "Around the world", from [the album] "Californication", by Red Hot Chili Peppers. The song starts with a note which seems was beaten by a hammer. Almost as a robot on slow motion, I came closer to the stereo, my father screaming for my brother to lower the volume... I was already hooked. SE! : How did you guys meet? And how did you form the band? One of the first important moments of your history was when you took part of the project BIG UP!, which helped projecting the group's name. What can you tell us about that experience? AG: Ten years ago, almost all of us had parallel projects, and the idea of doing something together, a band made of friends, kept coming. That's how Nunatak was born. I started with a bunch of very naked songs and surrounded myself with friends to dress them. What started as an unpretentious project gradually became a promising and exhilarating project. As you said, BIG UP! was one of those turning points in our careers. It is a band contest in which the winners play unplugged in the streets of Murcia, under the eyes of experts from the music industry. By the end, bands and experts – both holding beers – gather in a relaxed dinner where they can trade advice, experiences, etc.. We prepared our show with a lot of care and effort, and we believe it was one of the milestones in our growth as a band. SE! : What is the meaning of the name Nunatak? Not only the band's name, but several of your singles, LPs and EPs have titles related to nature. Why is that? And while some people just talk about nature (sometimes, only using it as a way to promote themselves), you really showed to care about it, creating the "green ticket" initiative. What can you tell us about it? AG: Nunatak is the peak of a mountain which is surrounded only by ice. Beyond the purely geographic meaning, in the glaciar eras, these peaks were shelters for seeds and spores that, once the snow receded, would repopulate nearby areas. We thought this idea of hope and life was beautiful for a band. For Nunatak, nature has always been a source of inspiration and worry, and, in this sense, we always try to expose through our actions the unfair things we see. One of these actions was "entrada verde" ["green ticket"]. In our previous tour, we made a second type of ticket available, which costed additional two euros. If you decided to buy this ticket, you were donating that amount of money to the Asociación de Naturalistas del Sureste and their campaign to repair the Mar Menor, a beautiful salty lagoon in the South of Spain which is in a critical situation after decades of pollution. SE! : What is your process of songwriting? Who writes the lyrics and melodies? And is there a special place or occasion you prefer for writing them? What would you like people to receive, to feel while listening to your work? Going further, how would you classify your music, in genre and style? AG: Everything begins with a progression of chords and a melody without lyrics. It is usually I who bring that primitive idea of a song into the studio, and we all shape it. Lyrics are also usually composed by me, but Gonzalo, our guitar player, has written several of the songs of our latest albums ("Solos", "A miles de kilómetros", etc.). If we can inspire, help someone overcome a hard moment, make company during a trip, or stir the conscience... making a person feel something like this with a song of ours, we are satisfied. We have a hard time classifying our music. We feel we put limits on ourselves when doing it, and we don't like limits. We could talk about pop-rock, but I believe any other label would limit our music. SE! : You organized a crowdfunding, in order to record your second LP. How was your experience with crowdfunding? And how was to record that LP with producer Luca Petricca, at Reno Studios? AG: It was a positive and intense experience. You get to know your fans, make them engage in your creative process, and you can interact with them in a very special way. Because of them, we could record our second album – a very good experience for an emerging band. "Nunatak y el pulso infinito" wouldn't be what it is without the talent of Luca Petricca, our producer. It was the first time we worked with a producer, kind of like our first professional experience in a studio, and it really was an adventure. We slept at the same studio, in bunk beds, and we were there 24 hours because of and for the album. It was an incredible week. "I started with a bunch of very naked songs and surrounded myself with friends to dress them"
SE! : Your live performances seem to be planned very thoroughly. What can you tell us about your concerts? What kind of details do you care about, in order to offer a good show? And how is it, for you, to be on stage, interacting with the fans? AG: For the last tour, we worked our live performance consciously with the help of Raúl de Lara. We took care of designing a repertoire which kept a constant energy, which dropped and exploded at the right moments. We linked songs, created instrumental fades to avoid silence, extended parts of some songs and cut others. We believe our live shows are our best weapon, and we always give 100% on stage. Being on stage for us is an explosion of adrenaline, pure energy, concentration, illusion. We love interacting with people, seeing their faces when their favorite songs begin, making them jump or shake their butts, making them sing along out loud. SE! : You have just released a new album, "Nunatak y el tiempo de los valientes". What can you tell us about it? And how would you compare this release with your first work? What has changed and evolved throughout time? AG: "Nunatak y el tiempo de los valientes" is inspired and dedicated to all those anonymous people fighting against their fears, facing their frustrations, being capable of hanging on one more day. This album is a hallmark, a turning point. The biggest difference from previous works is the combination of our accumulated experience and having the necessary time to record it. 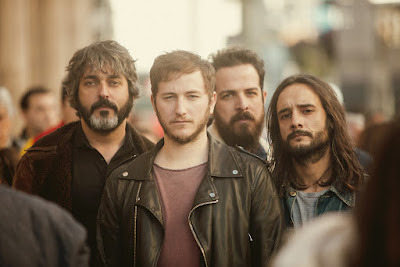 The album was recorded in Murcia with the production of Raúl de Lara, who was like one more member of the group from the beginning and knew how to take the best out of the songs and out of ourselves. We believe that, in this album, we've found a sound which represents us, and it is without a doubt our best work until now. SE! : Following the album's release, what else can your fans expect from you? What are your professional projects for 2018? AG: Short-term plans revolve around presenting our new album in spring and summer festivals throughout Spain. Around next autumn, we will start with our concert-hall tour, to which we are really looking forward – because that's when we will develop our show without restraints, with all the time in the world and with our fans close to us. It's too soon to plan further than that. SE! : You have already toured with British band Dry The River and shared stages with Noel Gallagher. How was your contact with them? And if you could choose anyone, who would be some Spanish and international artists you'd like to collaborate with, not only in tours, but also making music? AG: Both the magical week we spent opening for Dry The River and the two shows we shared stage with The Temper Trap were overwhelming experiences. We felt we upgraded: we saw how the professionals worked at close quarters, and that made us rethink many things, it made us better. If we had to choose, and dreaming big, we'd be thrilled to share stage with Arcade Fire or Foo Fighters (laughter). And in Spain, we've always admired Vetusta Morla. SE! : We would like to finish this interview with a song of yours. What is your favorite song by Nunatak, and why? AG: It is impossible to choose one, and if you ask me in a month from today, the answer would change. But today I choose "Sigues en pie". The creative process for this song was one of the most beautiful ones in this album. It is a song that, even when it has two chords, encompasses within itself an outpour of creativity, a party by The Beach Boys in the Caribbean (laughter). Latin beats, brass, strings, backing vocalists and a message which reminds us we are privileged, that all those ordinary problems are not important, and which invites us to be thankful for our luck in still standing.